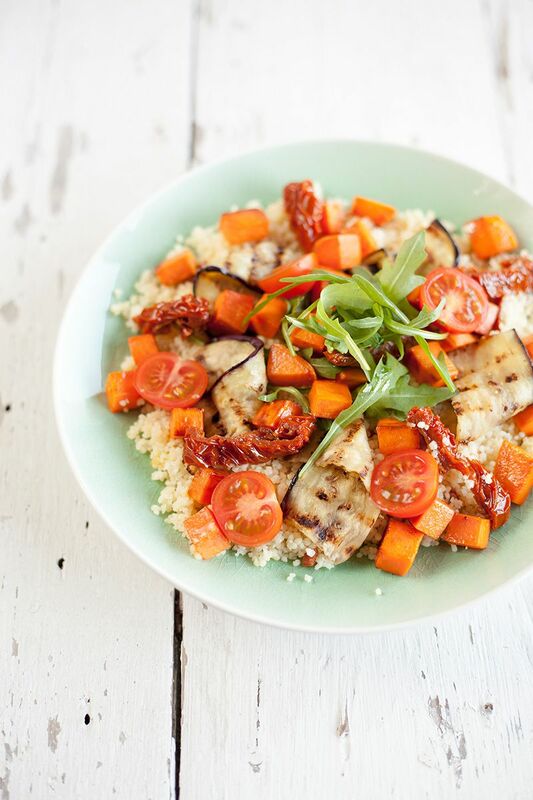 Place the couscous in a bowl and add some oil from the sun-dried tomatoes jar, pepper and salt. Pour the boiled water over, stir gently and cover it with cling film. You’ll see the couscous will absorb all the water and it gets fluffy and tasteful within 5 minutes. Stir every now and then. Peel the sweet potato and slice it into brunoise (squares). Finely slice the shallot and garlic clove. Heat a little olive oil in a skillet and cook the sweet potato for a few minutes. Add the shallot and garlic and cook them some more until the sweet potato is fully cooked, this will take about 8 minutes total. Season with salt and pepper. Slice the eggplant into long slices. 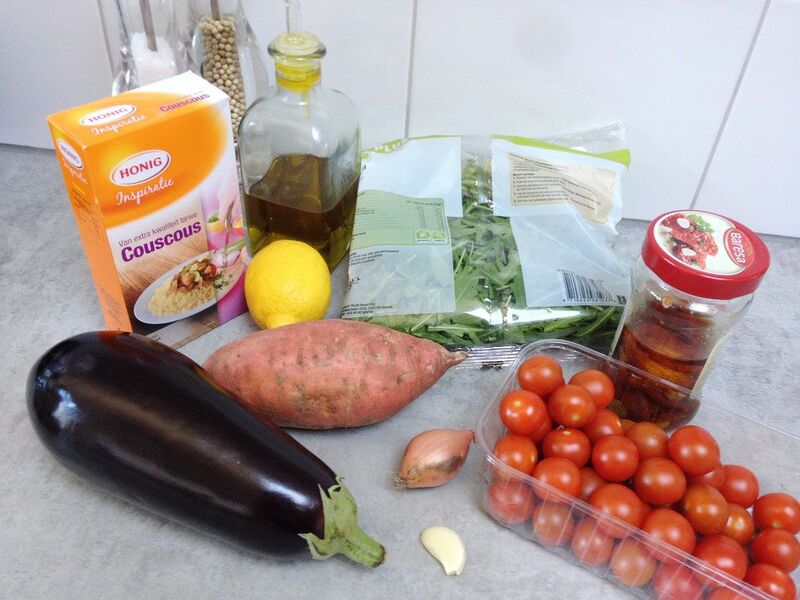 Pour some olive oil in a small bowl and brush the eggplant a little bit using a kitchen brush. 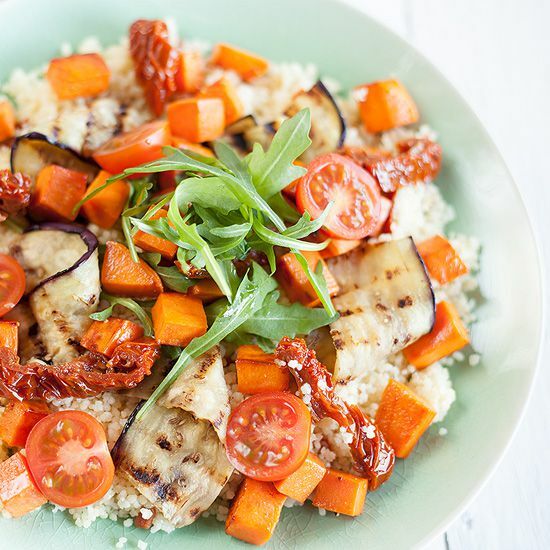 Heat the grill pan and grill the eggplant on both sides until golden brown stripes appear. Sprinkle generous with salt immediately. Loosen the couscous one more time with a spoon, season with salt and pepper. 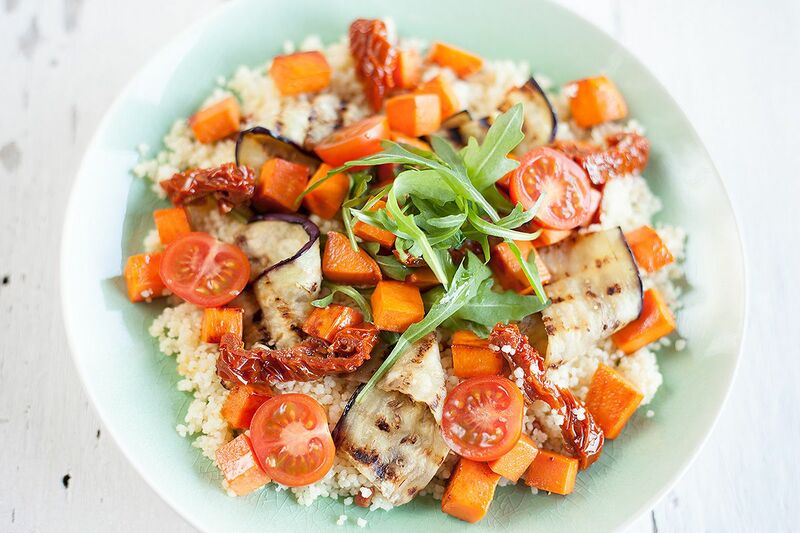 Divide the couscous over 2 plates, also divide the diced sweet potato and grilled eggplant. Slice a few sun-dried tomatoes into small pieces, halve the cherry tomatoes and divided over the two plates. Add a little bit of rucola, squeeze a little bit of lemon juice over the salad and drizzle with olive oil. Now this is a recipe after my own heart! Glad I found you! That’s great to hear! Thank you and we hope you enjoy the rest of our recipes too.